Despite the strident stand taken by the International Hockey Federation (FIH) that Hockey India be recognized as the sole body controlling the game for men and women in the county, the Indian Hockey Federation (IHF) is going ahead with its big plans to hold the prize money World Series Hockey (WSH) League across nine venues in the country. Indian eves crushed England by a huge margin of 51-8 to enter the finals of the women’s category of the second edition of the World Cup Kabaddi championship at the Shahid Bhagat Singh Stadium here today. Indian women maintained a lead of 28-4 till half time before finally defeating United Kingdom 51-8. Hosts Gujarat will be aiming for an innings victory against Delhi going into the final day of their second round Elite Group Ranji Trophy match. Starting the day at 118 for three, Delhi were all out for 233 in their first innings. After being on the receiving end in its opening match against Uttar Pradesh, Punjab came back in strong fashion in their second match as they defeated Orissa at the PCA Stadium here today. Defeating their opponents in a style, Punjabi University, Patiala, eves continued to dominate on the third day of the All India Inter-University Archery Championship that is underway at Patiala. The day started with individual Olympic round for both men and women categories in the recurve and compound round event. 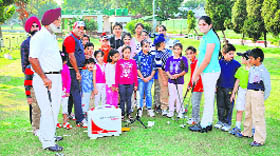 Chandigarh Golf Club Academy conducted a putting session for children under the academy's Junior Golf Development Programme here today. Youngsters were taught finer points of putting skill using the Sam Putt technology. The FIH has threatened the Sports Ministry with disaffiliation of India from international hockey, if Hockey India is not given recognition as the sole body, and if permission is given to hold the WSH, which is not a FIH-sanctioned event. The IHF received a shot in the arm when it got the go-ahead from the Sports Authority of India to hold the opening ceremony and some of the matches at the prestigious Dhyan Chand National Stadium in Delhi . The WSH, featuring eight teams and comprising 61 matches, will be held from December 17 to January 22. The WSH, promoted by Nimbus Sport, will have many innovative features, though the matches will be traditional in nature. Each match will be broken into four halves, with each session lasting 17 and half minutes. WSH will have a total prize purse of $2 million, with each player expected to receive not less than Rs 20 lakh. It will be a multi-city franchise-based event, which will be an annual feature, if the first edition shapes up as is envisaged by the promoters of the event. WSH technical director Dennis Meredith, a veteran hockey administrator who has the experience of being part of many Olympic, World Cup, Champions Trophy and Commonwealth Games, when he was with the FIH, said here during a presentation that the technical committee will consist of veterans like former India captain and national coach M.P.Ganesh, former captain Zafar Iqbal, former Indian Olympians Joaquium Carvalho, Ashish Balal, former Pakistan captain Shahbaz Ahmed and former chairman of the FIH Umpiring Committee Peter Von Reth. He said the WSH will give a big boost to hockey at the grass-root level across the country, and it would be more than a glamour event, which would be made commercially viable to benefit the players, host associations, the IHF and the sponsors. “The objective is to make more and more people come and watch the WSH matches”, said IHF president R.K.Shetty and secretary Ashok Mathur. Each of the eight teams will be allowed to recruit 25 players, though at any given time, only 18 players will occupy the bench, including 4-5 foreign players, during matches. And around 200 players will be distributed among the teams equitably, to create a level-playing field. There will also be video umpiring in all the matches to reduce the margin of supervising errors. Two matches will be played every day, starting at 7 p.m, and each match is expected to consume about 100 minutes. The final will be held in a best-of-three format. The match venues would be Delhi , Mumbai, Chennai, Bangalore , Hyderagaed, Bhopal/Pune, Chandigarh , Jalandhar and Amritsar . “There is tremendous potential for hockey consumption in the country, and the WSH hopes to create a hockey legacy of holding international matches across the country”, added Yannick Colaco, COO of Nimbus Sport, which is sparing no effort to make the league an outstanding success. One tricky problem facing the WSH is the SAI decision not to release the senior Indian players for the WSH, who would be attending the national camp for the Pre-Olympic Tournament, slated to be held in Delhi in February-March next year. “We are hopeful of getting the Indian players on board, as the WSH will be greatly beneficial for the players. It would give them the much-needed international match practice. Those who want Indian hockey to benefit and prosper would not oppose the national players’ participation in the league. This issue would be sorted out”, noted Ganesh with optimism. Ganesh added that no “petty politics” should be played to scuttle the WSH it would serve Indian hockey greatly. Rajwinder Kaur Raju with 6 points and Priyanka with 5 points were the best raiders from the Indian side, with Anu Rani ( 6 points) besides Jatinder and Jasbir with 4 points each, were the key stoppers. For England, Laumi Millennium was the only player to show some mettle on the ground as she got 3 points out the team’s total tally of 8. Earlier in the first match, Canada defeated Nepal by 64-22 in almost a one-sided affair. For Canada, Bhupinder and Jagjeet with 12 points each were the top raiders while Navjinder Happy remained the main stopper with 10 points. In the second match in the men’s category, UK defeated Germany 65-19 in a comprehensive victory. UK lead 33-8 at half time, the margin which they consolidated further to end the match with victory margin of 44 points. Jaspal Singh Palli and Rajvir Singh with 17 and 16 points, respectively, were the main raiders beside Baljeet got 9 points as a stopper. The Australian kabaddi team was suspended from the World Cup today following five of its players testing positive in the dope tests conducted by NADA. Director sports, Pargat Singh while confirming the development said besides the five players, two other players from the Australian squad were absconding. He said since out of a total 14 players, it was necessary for atleast eight players to be present at the ground, and they had only seven, so the team was not allowed to play their league match against Afghanistan. Pargat further said Australia will not be allowed to play further in this championship. He also said till date, 29 players belonging to various teams, had tested positive. Hosts Gujarat will be aiming for an innings victory against Delhi going into the final day of their second round Elite Group Ranji Trophy match. Starting the day at 118 for three, Delhi were all out for 233 in their first innings. Adding insult to injury, Gujarat skipper Parthiv Patel asked Mithun Manhas and co to follow on and at stumps they were 170 for five still 117 runs behind Gujarat's first innings score of 520. Chennai: Riding on a superb double century by opener Ahbinav Mukund, former champions Tamil Nadu gained a vital 55 run first innings lead over Haryana on the second day of the Elite Group-B Ranji Trophy match, here today. Mukund, resuming on overnight score of 110, continued from where he left and scored 204 runs to help Tamil Nadu post 403 all out in reply to Haryna's 348 all out. The left-hander occupied the crease for 526 minutes and 19 fours and two sixes in his 386-ball innings. Mumbai: Mumbai rode on centuries from Rohit Sharma and Abhishek Nayar to be in a good position to overhaul holders Rajasthan's massive first innings score in their Elite Group A Ranji Trophy match, here today. Sharma struck exactly 100, while Nayar made 155 before retiring at tea because of leg cramps. The host team defeated Orrisa by 8 wickets, to gain full five points from their second match. However, Orrisa have now failed to attain any points from their two matches. For his contribution with bat and ball in the first innings, Punjab’s Sandeep Sharma was declared man-of-the-match. “This was a must-win game. The main motive was to bowl out the rivals in the morning session. Sandeep and Barinder Singh have shown their potential whereas in the batting department, the team needs to improve a bit. Gitansh Khera, who fractured his finger during the first day, also stood up for the team and played a much-needed knock of 47 yesterday” said Vikram Rathore coach of winning team. Earlier, Orrisa’s batsmen failed cope with the pace of Punjab’s strike bowler Manpreet Singh Gony (5 for 13) and Barinder Singh (4 for 27). The duo took a total of nine wickets between them and bundled out the opposition for 73 runs in 34.5 overs. The pacers sent back both openers of Orrisa with the team total reading 17. For Orrisa, Subhrajit Sahoo (21) and Paresh Patel (13) contributed the most runs. After a brilliant bowling display, Punjab batsmen achieved the target in the 19th over after losing just two wickets. Opener Sarul Kanwar failed again and lost his wicket to Basant Mohanty while Uday Kaul gave his wicket to Alok Mangaraj. After the fall of these two wickets, Ravi Inder Singh (34) and Mandeep Singh (26) remained unbeaten and took the Punjab team to victory. “The morning session was difficult. The batsmen failed to click on the third day. The bowling attack of Punjab team was good especially Gony,” said Debashish Mohanty, coach of the Orrisa team. In the women section (compound event) three girls of Punjabi University, Ramandeep Kaur, P. Lily Chanu and Satyapriya Devi, have made it to the top four. The fourth player who made it to the semifinal is Anjali from GND University, Amritsar. In the recurve event also, three girls from Punjabi University, Priyanka, Tarika and Mukesh, have reserved their berths in the top four, whereas, the fourth player is Rupal from Kurukshetra University. In the men’s section (compound event), Ch Jignas from KLEF University, Guntur, AP, Sanchit from Amity University, Sunandu Rao from Krishna University, Andhra Pradesh, and Parveen from GDNU made it to semifinals. In the recurve men section, Avinash Kumar from VBS Purvanchal University, Pawan from GNDU, Bharat from VTU Belgaum and Balaji from MGK Varanasi University made it to the semifinals. Giving details of the semifinal and final matches, archery coach of Punjabi University Jiwanjot Singh informed that after the individual eliminations, tomorrow’s day would witness the main action with all teams competing in the team Olympic rounds. The semifinals and final matches for both team Olympic round and individuals would be held on November 14. Delighted with the performance of host university, Director Sports of Punjabi University Dr Rajkumar Sharma said his university have been champion for last three years and he was glad that they have lived up to their reputation. He gave the credit of their success to the vice chancellor of the university Dr Jaspal Singh who has provided them ample financial aid for purchasing world-class equipment and archery coach Jiwanjot Singh under whose training many of the players of the university have represented India. The session was conducted by Arjuna Awardee and Director of the Academy, Harmeet Kahlon and Manjit Kochar, Certified Golf Teaching Professional. In all forty children participated in the programme today. According to Harmeet Kahlon, the academy will conduct more such special sessions for young children of the tricity on a regular basis.